Doggy runs past all the potties in the house, but they are all occupied. And now Doggy has to go very urgently. 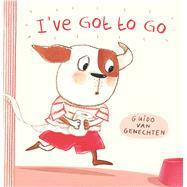 A funny potty book about a little dog who finds his way to the big toilet by accident. For everyone who has to go very urgently. Guido van Genechten is the author-illustrator of several bestselling children's books including The Big Baby Book, Mommies and Their Babies and No Ghost Under My Bed. He is the winner of the Reader's Digest Award for Best Children's Books Illustrator and the Picture Book of the Year in Holland.